:The Hope and A Future Olive Canvas Bible Cover has a rugged and casual feel and displays Jeremiah 29:11, â€œHope and A Future,â€ at the bottom of the canvas Bible cover. It will inspire anyone who receives it to keep a strong mind and spirit throughout their faith journey. Whether youâ€™re taking your Bible to church, Bible study, or to a discipleship meeting with a friend, the Christian Bible cover will protect your Bible and other materials from getting dirty or misplaced, and also provides space to hold all your essentials in one place. 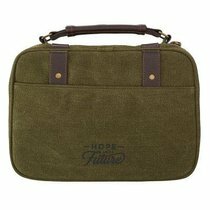 About "Bible Cover Canvas Medium: Hope & a Future, Olive Green, Carry Handle"